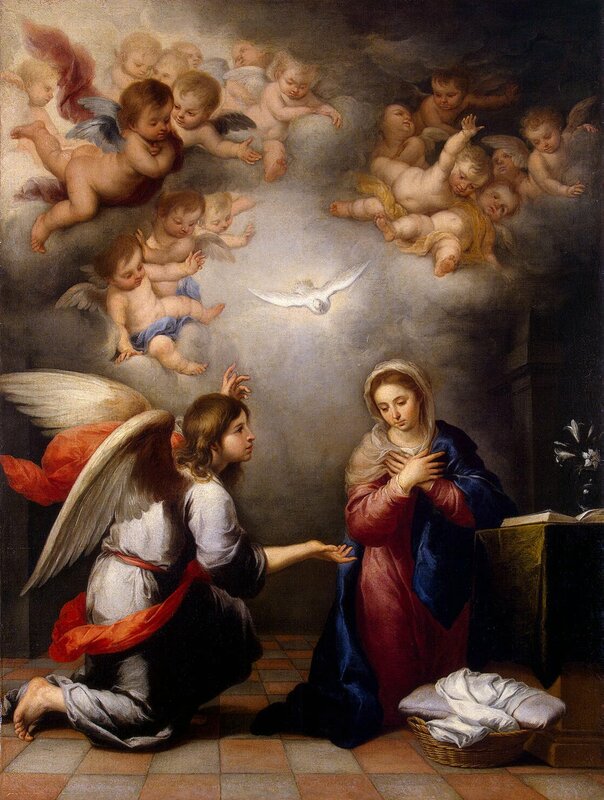 Annunciation, by Bartolomé Esteban Murillo, c. 1660. State Hermitage Museum, Saint Petersburg, Russia. It’s a beautiful artwork with a lot going on it it! The angel Gabriel kneels down before Mary, with his message that God is hoping that she will be the mother of Him. Angels crowd around the ceiling of the place, in yet another picture where Heaven touches Earth, and await her words. The dove, representing the Holy Spirit, comes down upon her as she assents. A vase of white lilies — a typical symbol that you’ll often find in Annunciation artwork as it represents chastity and virtue — sits on a desk. Beside the vase, a book, presumably a religious book, rests on a prie-dieu (a type of religious desk that is specifically built to hold religious texts so you can kneel and read), symbolizing her complete devotion to God. So, what did my toddler point at? The basket of laundry right in front of Mary! And I couldn’t help but laugh. After all, so many beautiful, beautiful things are going on in this artwork! Yet, it was the mundane and ordinary that caught my toddler’s eye and made her stop and wonder. But perhaps that’s just as well! After all, it’s very hard to peacefully resign yourself to the mundane and ordinary, instead of pursuing greatness and glory. Speaking personally for myself, that was one of the hardest things about becoming a stay-at-home mom. Instead of pursuing professional success in the biotech field using my degree in biochemical engineering, I decided to have children right away when I got married and stay at home to take care of them. And, trust me! There is a greatness in having children all by itself, don’t get me wrong! Still, it was quite an adjustment to go from a place where I was engaged in important-sounding projects examining antibiotic-resistance to dealing with the simple life that having children and taking care of a household. Plus, it was a bit hard on my pride — being a biochemical engineer sounds a lot more impressive in the world’s eyes than being a mother. And yet, young children make you realize that there is greatness to the mundane as well. The other day when I peeled potatoes, both my children — my three-year-old daughter and my 17-month-old son — flocked around me with wide eyes, watching with rapture every single stroke that I made to peel off the skin of the potatoes. My son did everything he could to reach the potatoes, while my daughter cheered me on. A simple act of peeling potatoes — something I consider to be a rather tedious chore — was the most amazing thing that they could witness in that moment. And perhaps that’s why it’s so fitting that there are so many pictures of the Annunciation with Mary in the middle of doing laundry — because she was faithful enough to find glory in God, both in those great moments and in the mundane. And perhaps that’s why it’s so fitting that my little daughter focused on that laundry basket so much. Her name is Mary, after all. Help us find glory in those small moments — in our chores, in our day-to-day activities, and in our work — and do them with great love so we may offer up that glory to You. This artwork is one of many that is featured in my new book, which pairs every single prayer of the Joyful Mysteries of the Rosary with a religious artwork. Find out more about the book here! ← Happy All Souls Day!